Over the last 10 years, the British Muslim community has endured and witnessed the toughest decade since the post-war period when mass migration of Muslims to Britain took place. Unlike our elders whose self-segregation from mainstream British society was a defensive reaction to racism, second and third generation Muslims have been under attack for their faith. By God’s Grace, as far back as 1990, my sister Fatima Alvi and I won the right to wear the Islamic headscarf at Altrincham Grammar School for Girls in Cheshire. Prior to this, we were suspended from school after two long years of persuasion, and negotiations broke down. Finally, in December 1989, we made a completely independent decision to attend school and refused to remove the covering from our heads. What did we go armed with? Our faith in God and knowledge of our educational rights. What was all the fuss about? This was not a battle of wills and we did not want to jeopardise our education. We were privileged and attended one of the best Grammar schools in the country, but we simply wanted to follow our religion as prescribed by the tenets of Islam. Discussions ensued between ourselves and the head of the school, and on one notable occasion, the Holy Quran was opened and the school insisted that there was no evidence to suggest that we needed to cover our heads at the tender age of 14 and 15 respectively we were not only attempting to secure a basic right to practice our faith, but we were having to justify that donning, what was to us, an inconspicuous cloth on our heads was compulsory in Islam. This was an out-of-court battle won by the media. Being the first such case of its kind in Britain, it hit the headlines, creating phenomenal national and international media interest. The tabloid front-pages relished it. The school’s attitude was to find an alternative school, the public’s was, ‘if you don’t like our way of life, then you should go back to your own country.’ Everyone had an opinion and we were the centre of discussion everywhere. Britain was being tested on its levels of tolerance, something novel for the Muslim community at the time. The school was in the limelight for the wrong reasons – not for their usual academic recognition, but for being intolerant of Islam. We gained unexpected support from the Commission for Racial Equality, National Union of Teachers, Jewish Gazette, Manchester Council of Mosques; the list was growing and swinging the pendulum back in our direction. So the head and Governing Body were being forced to back down. My love for wearing hijaab is purely, this: it is a commandment by Allah, my Creator, in the Quran. My scarf is my pride, honour and dignity and it has shaped the person who I am today. It may bring hardships and difficulties but it is with pride that I deal with these. At the time, anti-Islamic sentiments were not widespread. Our conclusion from the school’s attitude and the piles of hate mail was simply that ignorance prevailed in Britain, but we never considered that these were deeply-rooted prejudices. How naïve we were. We are witnessing in Britain, like many in Europe, an unashamed national reaction to the new visibility of Muslims. Our memories are short but need we be reminded of the genocide of Bosnian Muslims in 1992, long before 9/11 and 7/7. They did not practice Islam assiduously, they inter-married with fellow citizens, and were certainly not visibly Muslim. Nevertheless, this did not prevent a mass victimisation of Muslims through an ethnic cleansing. In the Summer of 2009, Marwa Al-Sherbini died the ‘headscarf martyr’. Marwa was a 31-year-old veiled Egyptian pharmacist who was brutally stabbed eighteen times in a German courtroom as her 3-year-old son watched. Her attacker was a German man who was being prosecuted for calling her a “terrorist” and, in one incident, tried to rip off her headscarf. Marwa’s tragic death took place just days after Nicolas Sarkozy gave a major policy speech denouncing the burka and the resurgence of far-right groups in the latest European elections. 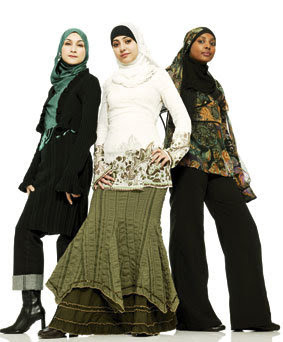 We can now ask ourselves this question: does the law afford us any protection in our varying forms of Islamic dress? The answer in short is ‘No’. The same battles rage on in a climate where prejudices towards Islam and Muslims have intensified beyond comprehension in my lifetime. The right to wear the hijaab in schools has brought the same arguments back to the drawing board, the arguments which we once faced by our head, whose sentiments echoed “when in Rome, do as the Romans do”. Globalisation has changed multicultural Britain overnight. We cannot all be deported back to our motherlands, so we are being told the best Muslim is the one we cannot visibly see. If you don’t want religious freedom in this country, ban the religion, but don’t ban parts of a religion that don’t fit in with British sensibilities. Islam is totalitarian and let us not be apologetic for that. Real practical progression over the next decade will only be seen when Muslims are truly accepted in wider British society and Muslims genuinely feel free to practice their faith. My vision is a Britain that allows Muslims and all other faiths to practice their faiths openly and freely without the fear of England’s green and pleasant land being taken over by people who are not white enough, or not atheist, secular or Christian enough. The future is bright, the future is an Islam which is part and parcel of British life. The solution lies in the hands of each and every single Muslim living in the UK and all Muslim organisations. Aisha Alvi, Barrister at Law, LLM (Islamic Law) University of London, aims to use the privilege of her training not for personal gain, but to show the wisdom of the Shariah. Recently, her expertise in Islamic law and the English legal system has led her to be involved as a key advisor in several anti-terror prosecutions. We need to take ownership of our community before others do.